Hard to believe but it’s been 3 and a half weeks since Tristan’s melanomas enlarged and I thought we would be deciding on euthanisa. So it’s definitely update time. The drainage has slowed considerably and I had very little to clean off today (I’ve been gone for a week). The drainage hole itself has gotten much smaller also. I’m very pleased with the overall size of the melanoma mass under his tail. Yes, it’s bigger then it was 12 months ago, but considerably smaller before this whole mess started. Unfortunately, we weren’t able to get a good shot today with the phone camera so I marked the bottom edge of the melanoma mass with a green line. I wish I had measured them so you would have a better idea of what has been happening. 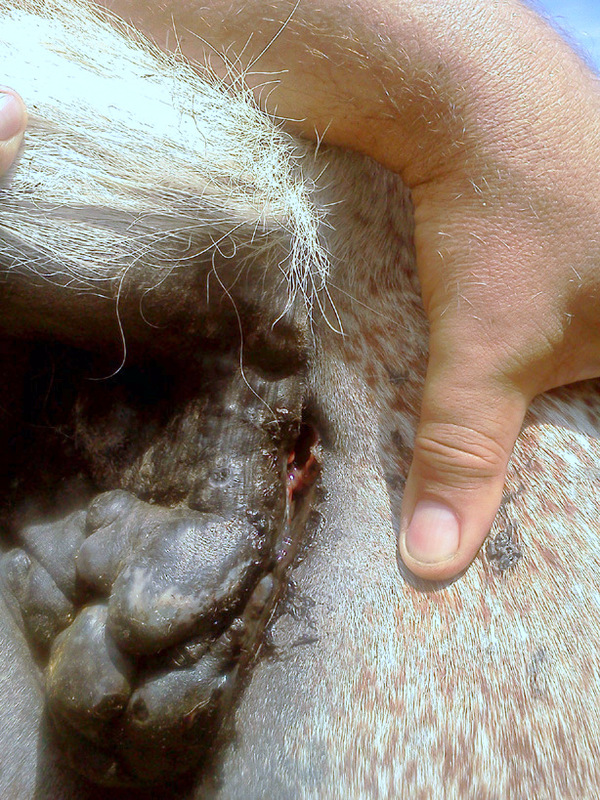 The mass, which is actually several melanomas all under the tail, have had a huge reduction in swelling. On Day 1 they were bulging outward with an guesstimate of about 2 inches? Once they started draining, and the antibiotics had a chance to kick in (antibiotics do not kill or eliminate melanomas, this was for an infection) they started deflating like you see in Day 4. Today, they were larger then they were a year ago but definitely reduced in size. Whether they will get any smaller I rather doubt but at least we got through this crisis. This entry was posted in Tristan. Bookmark the permalink.